OUTSPOKEN: There is no telling how many Sarawakians out there truly want to see the state leave Malaysia. It could be many. Or it could be just a few. But what is certain is in this age of Information Technology, people get informed with so much ease and those with a common cause or goal to fight for, coordinate their actions and efforts better. The Internet has indeed helped to amplify the voice of this group of Sarawakians to a level loud enough to attract attention and raise some concerns. The Sarawak state government is rather circumspect about the matter, probably because it knows that independence is not what the majority of Sarawakians want. It probably feels that the call to pull out of Malaysia is made out of frustration at not being able to get from Putrajaya what people thought they deserved. Chief Minister Tan Sri Adenan Satem’s administration probably think that it is not independence that the people really want but a Sarawak that is an equal partner in a Malaysia made up of Sarawak, Sabah and Malaya. It is really not difficult to understand this line of thinking because there is no questioning Sarawakians’ pride for Malaysia and in being Malaysian. If it isn’t for this pride, Sarawakians, like the nation’s most decorated war hero Datuk Temenggong Kanang Langkau and George Cross Medal recipient Awang Raweng, would not have bothered to step on Malayan soil in defence of the country. No, independence is not what Sarawakians want because it would render meaningless all the sacrifices of those who gave their lives to create this nation we call Malaysia. What we have created with cost that is immeasurable, that cannot be translated into ringgit and sen, and that no one can ever compensate enough, we cannot destroy. “We have made the decision to form the federation 50 years ago and nothing is going to change that. We will stay forever in this nation,” Adenan declared at a state-level National Patriotism Convention at Universiti Malaysia Sarawak (Unimas) last Oct 19. He went on to warn that secession from the Malaysia Federation would only lead to unimaginable and dire consequences that would disadvantage Sarawak. Adenan, however, did not warn pro-secession Sarawakians of arrests; neither did he threaten them with the Sedition Act because there is really no need for that when Sarawakians in general only clamour for better treatment from this nation, not to break it up. This is the part that the federal government must try harder to understand. Putrajaya and Umno have a lot to learn. They have a lot of accepting to do. And most of all, whenever it concerns Sarawak and Sarawakians, Prime Minister Datuk Seri Najib Tun Razak cannot act without consulting Adenan and his government because they are the true voice and aspirations of Sarawakians. The state government understands Sarawak and Sarawakians better. “They (Malayans) have a lot to learn from us and that is also why I will not allow any racist or bigot to enter the state,” Adenan was quoted as saying. Adenan went on to say that only Sarawakians understand each other and it takes a Sarawakian party to know the people who are made up of a vast number of races, religions and cultures. He said Sarawakians had never fought or argued on racial and religious issues and Malayans who raised and blew issues – like the use of the word ‘Allah’ in the Malay Bibles – out of proportion must take note of this. The prime minister must take note as well. He must know. He should have known, otherwise he would not have warned those pushing for secession of Sarawak and Sabah from Malaysia “to be prepared to face the full force of the law”, on Malaysia Day in Miri. His warning was misplaced. There is no need for that warning because if he had known, the actual demand is, like I said earlier, not independence, but for Putrajaya to live up to the terms of the Malaysia Agreement. For Sarawak this means satisfying 18 matters, among which are issues that Putrajaya continues to ignore, sidestep, procrastinate on, and at times, reject with impudence. 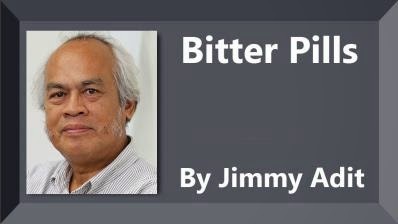 PRS president Tan Sri Dr James Masing echoes every Sarawakian’s sentiment when he slammed The New Straits Times’ columnist Mohd Hazmi Mohd Rusli for writing that “Sabah is also blessed to have joined Malaysia”. “Hazmi got his history on Malaysia all wrong when he wrote Sabah is blessed to have joined Malaysia. It is this type of error which has caused uneasiness among Sarawakians and Sabahans. By no coincidence, this point is basic to the Malaysia Agreement, yet even an educated and knowledgeable Malayan has refused to accept a historical fact; let alone lesser Malayans. When Minister in the Prime Minister’s Department Datuk Seri Jamil Khir Baharom told parliament that Malaysia is not a secular state as the country was historically set up based on an Islamic Malay sultanate government, Masing was quick to respond, saying the four signatories agreed to sign the Malaysia Agreement on the basis that Malaysia was understood to be a secular state. “Over the years, interpretations have changed, which have resulted in misunderstandings. Perhaps the ‘men of law’ should clarify the situation once and for all,” Masing said. He said any move to shift Malaysia from being a secular federation would automatically question the entire basis of the country’s formation as secularism was one of the pre-conditions offered by the country’s first prime minister Tunku Abdul Rahman when Sabah and Sarawak signed for the federation in 1963. He said if Malaysia were to become an Islamic state and no longer a secular state, then the basis for the two states as part of the federation would cease to exist. “This may also be the reason that religion is a state matter. So what and why is the federal minister making such a remark?” asked Jeffrey. Jamil has yet to answer, much like Putrajaya, which has continued to keep Sarawakians guessing on so many unanswered questions. Frustrations have certainly built up, and if historical facts can be lost in interpretations, it is not a wonder if Sarawakians’ frustration is interpreted as wanting to pull out of Malaysia. The fact is, Sarawak wants to be treated as Malaya’s equal.